With a hosted Microsoft Exchange 2007 mailbox service you can view, share or edit your Outlook calendars with other exchange users within your organisation. If you do not already have a hosted Microsoft Exchange service with Webvault you can apply for one by visiting our website or by contacting our customer support team. You can only share your calendar or view the calendar of another user on exchange if you give them permission. This tutorial shows you how to invite another exchange user to view your calendar, to request to see their calendar and/or and to edit your calendar permissions. 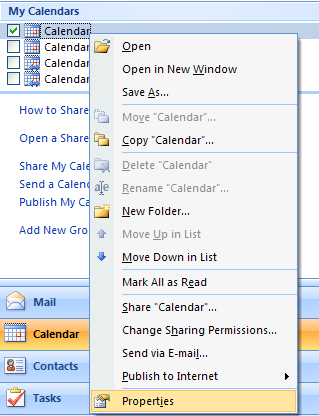 To share your calendar, click on the Calendar tab of the Navigation pane in Microsoft Outlook as shown. Outlook will now popup a new email window which will facilitate you choosing the correct exchange user to share your calendar with and then sending them an advisory email. 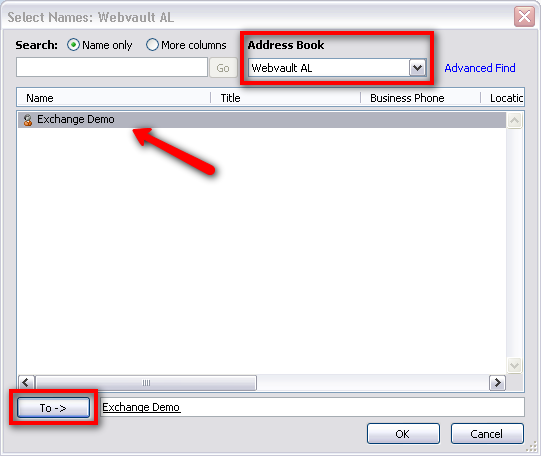 Click the To... button as shown to select an exchange user recipient. NOTE: You cannot share your calendar with any email recipient, you must select a valid exchange user account from your Organisational Unit Address List. Do not just type in the users email address in to field, in most cases this will NOT identify the correct exchange user. After pressing the T0... button, you will be presented with Select Names dialog box. Using the Address Book drop down list, select the appropriate Organisational Unit AL (Address List), this address list will contain a list of valid users within your organisation with whom you can share your calendar. DO NOT choose a user or address from your outlook contacts list. Select the list of users to share with from the list, and then click the To -> button down the bottom. Check the list of recipients is correct, then click OK to add them as recipients to your invitation email window. Once you have selected the appropriate users, you will see their exchange username in the TO field of the new Sharing invitation email window. If you wish to Request to also view the recipients Calendar, tick the checkbox provided. You can optionally write them a short message in the space provided. When ready to send your sharing invitation, click the Send button. 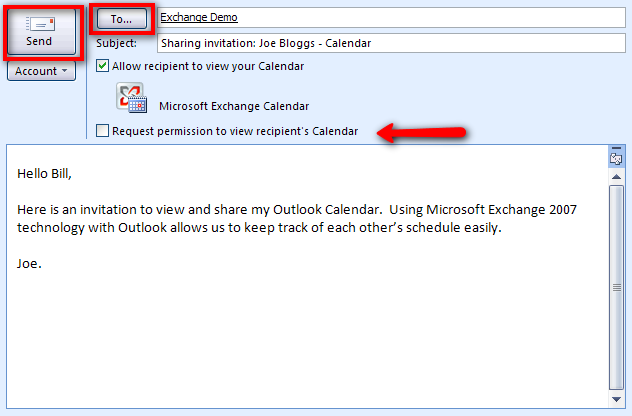 When the recipient user accepts your invitation to share your calendar, Microsoft Exchange will automatically give those users the rights to read and view your calendar. If you wish to allow other users to edit your calendar, you can modify the permissions for your calendar by following the instructions below. To edit the user permissions for your calendar, click on the Calendars tab in the navigation pane on the left hand side in Outlook. 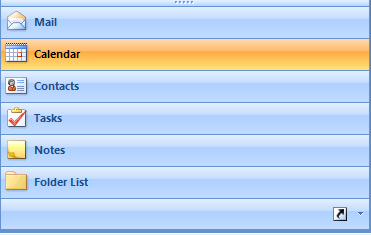 Right-Click the calendar you wish to edit and choose the Properties option from the context menu. In the Calendar Properties dialog window choose the Permissions tab. At the top you may already see the list of users that can view or read your calendar. 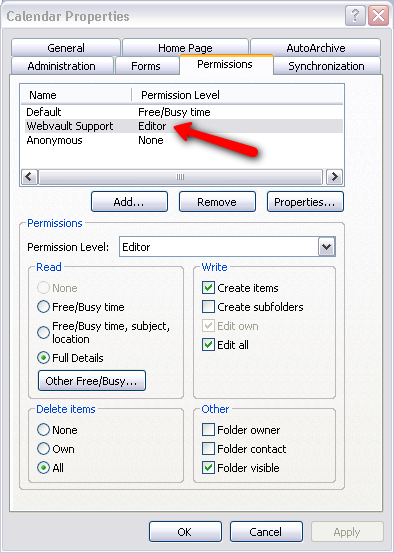 If you wish to allow a user the ability to edit your calendar and not just view it, then you can change that user to having a Permission Level of Editor using the drop down provided. Click OK to save your new calendar permissions.